Sometimes, it's the little things that make the most significant difference. While you might not give much thought to the buckle of your gun holster belt, your choice can have a considerable impact on your holster set-up's appearance. The quality of the buckle is vital for ensuring the durability and longevity of the product, as well as maintaining its good looks. 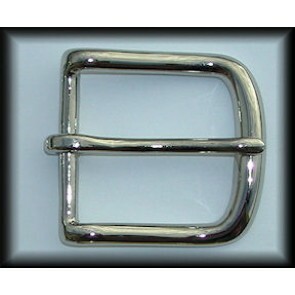 Many of our customers prefer chrome as their belt buckle material. Chrome, which is short for chromium, is a durable metal that is relatively easy to plate onto other metals. A chrome finish is known for its gleaming appearance that can enhance the visual appeal of the finished product. A chrome belt buckle from High Noon Holsters will make your belt stand out — you'll be proud to wear it whenever you carry your holster and weapon. Our chrome belt buckles adhere to the exceedingly high standards for quality that have been the hallmark of our company since 1997. We also understand there's a slight chance you might not be completely satisfied with your buckle when you receive it. If you're not happy with your purchase for any reason, we'll do whatever it takes to remedy the issue. If you still find that buckle does not meet your expectations, return it to us within 14 days for a refund — no questions asked. If you've had a previous bad experience with purchasing holsters and accessories online, you're in for a change when you order chrome belt buckles and other products from High Noon Holsters — you'll be able to find what you're looking for quickly and easily. You can then add the items to your wish list and complete the simplified checkout process. And if you need your buckle in a hurry, our fast shipping policy will meet your requirements. Experience the fantastic look you'll get by wearing a gleaming chrome belt buckle from High Noon Holsters with your belt and holster. Order yours today!